เรื่อง The Money Myth – How the Current Financial System Really Works: and Why We Need to Change It. The Money Myth, by financial consultant Matthew A. Hinde CA(SA), clearly articulates how the financial system actually works and why it’s making financial security harder and harder for ordinary people to achieve. In the book he describes in an easy to understand and very practical way the causes of our current economic challenges and what needs to be done to solve these problems. In the process, he walks the reader through the recent history of money, focussing on the United States as a case study, where he looks at the significant evolutionary steps that have taken place around it and how these changes are affecting nations and individuals. 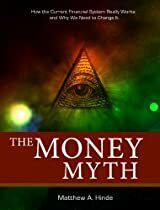 In the book he looks at money from a conceptual point of view and explains the reasons for the move away from the Gold Standard and the role the Federal Reserve plays in regulating money. He goes on to explain the effects of the Federal Reserve and how it institutionalises the concept of Fractional Reserve Banking and debt-based money. After describing the current financial system and the effects it creates in an easily understandable way, the book looks at what needs to change and how money needs to be regulated for economic stability and financial security to be restored. Product Tag The Money Myth – How the Current Financial System Really Works: and Why We Need to Change It. : The Money Myth – How the Current Financial System Really Works: and Why We Need to Change It.,เรื่อง , แนะนำ , The Money Myth – How the Current Financial System Really Works: and Why We Need to Change It.